Games have imitated traditional media in many ways. Some genres borrow the visuals and directing qualities from movies, others use story structures and character development from literature, and some others apply art styles from all kinds of historical art movements. On the other hand, games distance themselves from traditional media. An example is player agency, or how you can influence the flow or outcome of a narration. But there is one narrative form that games excel at: the emergent narrative. In an emergent narrative, the story is not designed by developers. It is constructed by the player, through his (inter)actions and explorations, while often influenced by any number of (game-specific) random factors that each game features. As the name suggests, the narrative will emerge as the player continues to play. Sounds abstract, doesn’t it? Yet, I’m almost certain that most of you have benefited from this form of storytelling. Allow me to illustrate this principle with some examples. I think any iteration of Civilization is a good place to start. In Sid Meier’s Civilization-series, you rewrite history as your civilization is placed in a random world. You can decide where you build your cities, whether you are a peaceful of warmongering people and perhaps most importantly: you set your own goals. Sure, the game allows you to ‘win’ using certain conditions, but after a few playthroughs you are tempted to set your own victory conditions. Many players are known to create their own objectives, adhere to personal rules or limit their game progression in one way or another. They will often post their experiences on the internet. Each of these unique experiences is a story of its own. No one will ever experience the same causally linked series of events (probably), even when the same starting parameters are used. Of course, there will be similar experiences, such as a certain leader declaring nuclear war on you. You’re not fooling anyone, Ghandi! But every player creates his own journey, whether it happens consciously or not. You can experience some of the greatest stories ever told this way. Epic battles between supernations, or the struggle of a dwindling people as they try to survive. You could encounter hilarious scenarios where Mech-warriors fight against Stone Age spearmen (and lose! ), or watch in confusion as an AI faction builds a city on a tiny island with no resources. And the best thing: these stories are created organically, without the need for a developer to script a storyline or fixed events! Free stories for all! Minecraft is another good example. 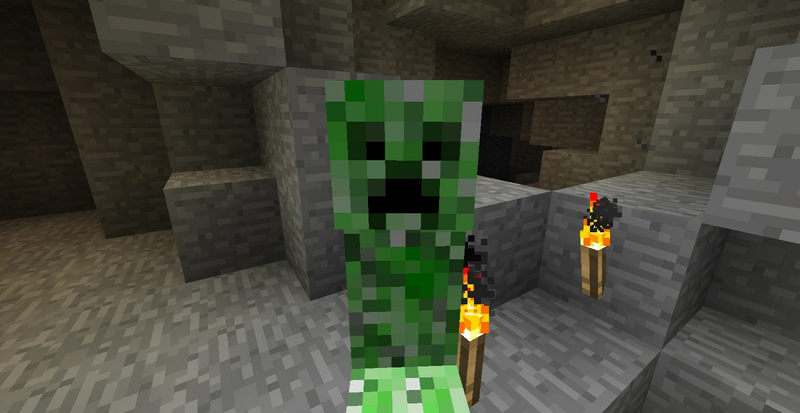 In Mojang’s Minecraft, you are dumped in a random world, filled with biomes, creatures, monsters and even a few villages. Your goal is simple: survive. To survive, you will need to craft tools, gather food, mine resources, explore territories, and build structures. The game isn’t guiding you here. At most, it tempts you with achievements: little nudges that simply show what you could do, such as craft an axe, or bake bread. There is no obligation to do any of these, although you will likely complete at least some of them by simple playing and progressing through the game. The game is also endless. Yes, I’m aware that you can travel to the Nether, and then into the Ender, and you can battle a dragon after which you would have ‘completed the game’. But this is not truly an ending; at most it’s another achievement. I know I’ve never made it even to the Nether, because I’m simply having too much fun exploring, building and crafting. The game may not come with a story, but every player has constructed his own story simply by playing. Your story will include what goals you set for yourself, how often you die, the various encounters with monsters and your adventures as you mine deep below the surface. And also a lot of the random stuff you’ve encountered, such as that time you were stalked by a creeper in the middle of the ocean or when you and your friend fell down a cliff. These experiences are unique, unplanned and the building blocks for your personal story. Emergent storytelling is booming. Just take a look at the number of games that feature procedurally generated content that have appeared in the past few years. Technology allowed these games to be created, and players are having a blast generating their own stories. I suspect that Real Time Strategy (RTS) games were among the first to feature emergent storytelling, since they hardly had a story to begin with (especially in random skirmish maps). Nowadays, you will find many survival games, such as Day Z, State of Decay or Rust. On top of not having to write a pre-defined story, you can usually get away with limited enemy AI, since your foes are usually brain-dead zombies. I think (the success of) Minecraft is the main inspiration for these types of games, although Mojang’s hit game wasn’t the first to do this. Quite often, the random occurrences in a game are linked to fixed story events. If we have a look at Undead Labs’s State of Decay, there is a (rudimentary) story present that deals with a group of survivors as they organise themselves and finally leave the valley they are trapped in. But the best experiences come from the random events that the player leads himself into. Or that the stunted AI leads the player into, in some cases. All aboard the zombie train! But in most cases the storyline, much like Minecraft’s achievements, are meant to guide the player towards new opportunities. Because of the high degree in player agency in these games, it’s hard to accomplish character development, since that depends on fixed events. The stories are meant to support the emergent narratives that the player is supposed to construct. Emergent narratives potentially bring the game genre closer to historical literature, especially non-fiction. Here, a narrative is constructed out of the random sequence of events that happened at some point in time. History has no predefined story arc, although some ‘characters’ will have plans and agendas. The difference between non-fiction and emergent narrative games is that the authors of non-fiction have linked the events together to create a story. While the events in games are still open, an author has decided which events and characters to use and which to ignore, alter, or fuse with others. Even though you may find players who write down their stories and publish them on the internet, you’ll be hard pressed to find a game that does it for them. I think that would be the next big step in emergent narratives (and what I’m actually trying to accomplish at the moment): games that reflect on prior events and as a result sequence, summarise and assign causality to them. 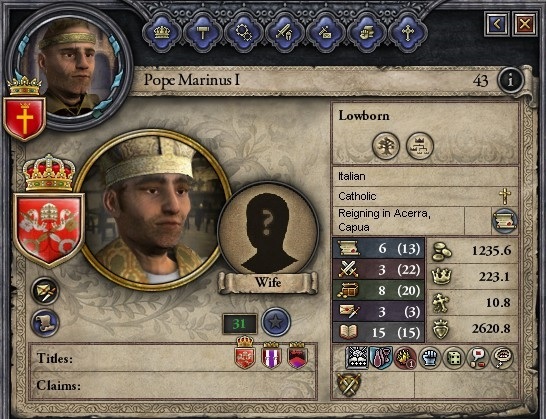 A personal favourite of mine is Paradox’s Crusader Kings 2. In this medieval society simulator, you play a bloodline instead of a single character. What I think is wonderful, is that each character is basically a non-animated data set. Characters are represented by a name, a portrait and any number of personality traits. These traits increase the chance of certain events happening to the characters, but the player often retains the opportunity to prevent these events. What I’m saying is: characters in Crusader Kings 2 are hard to identify with, as they are quite static and lifeless. They are essentially Excel-sheets. But each game contains a lot of these Excel-sheets, that all interact with each other. Every king has a family, courtiers and vassals, who have families, courtiers and vassals of their own, and so on. When so many random factors are brought together, you can expect spectacular things to happen. Strong empires may collapse because of one tactical blunder, or a small county can benefit from an exhausting war between giant kingdoms and quickly become a world power itself. Miraculously, players truly experience these Excel-sheets as characters; possibly even as living entities with a mind of their own. You can find hilarious tales in the player reviews of the game. Players connect the random events on a regular basis, and add motivations and coherence. It’s a beautiful thing to behold, and I recommend you spend some time to read them. Don’t worry, I’ll wait. 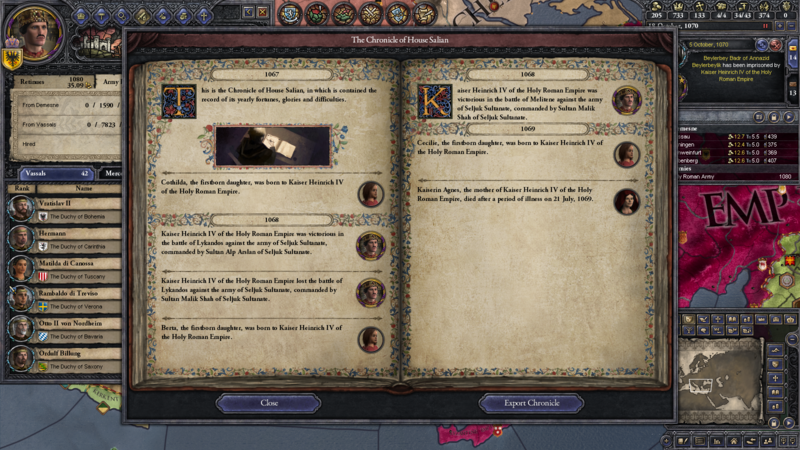 On top of this, Paradox added a feature dubbed the Chronicle, that summarises all major events that happened to your bloodline per year. That means that they are trying to do the players work for them. And that sounds pretty revolutionary to me! Sure, the stories created by players will be more creative and imaginative, but more players will realise they are experiencing a story when the game presents them with refined building blocks. And so we arrived at the greatest pitfall of emergent narratives. We’ve seen that games can generate story events endlessly. But this doesn’t constitute a proper story. It requires effort from the player. Without the act of collecting these events and constructing a narrative theme, the story events are hollow. If you want a story to be created, you need to filter the story events on relevance. You could tell a story about an exploration expedition in Minecraft, so you’d need to (re)collect all the story events that fit the exploration theme: leaving your base, finding out where to go, defend against enemies, find shelter when night suddenly falls, return to base. Similarly, if you want to tell a tale of how you conquered China in Civilization 5, you need to select the events that deal with strategy, war, military units, etc. You don’t need to include that you found a new resource close to your capitol, or that you struck some trade agreement with Sweden. Unless these events affected your invasion, of course. But it requires effort from the player to select and link these story events, and it would be interesting to see how many players actually do this. Perhaps 80% of the players couldn’t care less about emergent stories, since they just want to ‘win’ the game as fast as possible. Ideally, we might want to design some sort of protocol – unique for each game – that is able to logically connect game events to create a coherent story. This is major technological challenge, as it would require human-like thought processes: reasoning, prioritizing, connecting and evaluating. This calls for norms and preferences to be included in the protocol. This could then lead to character development in real time, as the story progresses, through randomized processes. Emotional reactions are already simulated in games, but they are simplified: a team member dies = high risk of sadness, etc. The ideal protocol would identify what a person requires or what motivates him, followed by a construction of goals and goal-oriented actions that ought to be accomplished to achieve personal gratification (or lack thereof). All in all, it requires an Artificial Intelligence just for story reconstruction. It would need to think on a deeper level than simply checking achievements and spewing scripted consequences. Instead, it should be able to evaluate a character’s disposition at any point in time and cross reference this to their projected goals. If there is a change detected, either because of development or incongruence, then the projected goals should be adjusted accordingly. Alright, at this point we’re talking science fiction. I doubt many developers would be keen to spend that much development and processing power to a mechanism to reconstruct stories with, especially when you want to approach human levels of interpretation quality. But then again, how much progress in art and science was made exactly because of dreams and science-fiction? Perhaps at this moment, someone, somewhere, might be working on the very things I present here. ← Why should we interpret a game? Email me some time, I feel the same exact way about emergent narratives and would like to bounce some ideas off of you sometime. I, like yourself, see some sort of standard existing in the future to combine player development in an organic manner and would like to discuss this sometime.